ONLY YOUR CONVICTION WILL MAKE YOUR DREAM COME TRUE, NOT SOMEONE ELSES CONVICTION ABOUT YOU. We cannot change the fact that people will have their own opinion about who we are. But who we will becoming? Only God knows. But the one thing we can do is having the right attitude towards ourselves, and our future. KEEP A POSITIVE THINKING TOWARDS YOUSELF, AND OTHERS. YOU CAN BE ALL THAT GOD CREATES YOU TO BE, WITH ALL THE POTENTIALS HE PLACED INSIDE OF YOU, NOT AROUND YOU. SO, DIG DEEP WITHIN TO FIND THE TREASURE HE PLACE IN YOU. IN THE BOOK OF HEBREWS 4:15, THE WRITER STATES: FOR WE DO NOT HAVE A GREAT HIGH PRIEST WHO ANNOT SYMPHATHIZE WITH OUR WEAKNESSE BUT WAS IN ALL POINTS TEMPTED AS WE ARE, YET WITHOUT SIN. IN LOVE WILL PREVAIL BY DIEUNA AND LUTHER CHRISPIN, WE HAVE TWO PEOPLE WHO CAN SYMPATHIZE WITH OUR WEAKNESSES BECAUSE THEY HAVE ALSO EXPERIRNCED WEAKNESSES BUT THIS IS NOT A STORY ABOVE WEAKNESSES, BUT ABOVE VICTORY, VICTORY THAT IS ONLY FOUND IN AN ABIDING FAITH IN JESUS CHRIST OUR LORD. I RECOMMEND THIS STORY. LOVE WILL PREVAIL IS A BREATHTAKING LIFE STORY ABOUT LOVE, PASSION, FORGIVENESS, AND HOPE. MOST IMPORTANTLY, THE BOOK IS CENTERD AROUND THE LOVE OF CHRIST FOR HUMANITY AND HOW HE WILL ALWAYS BE VICTORIOUS. LOVE WILL PREVAIL IS A STRAIGHT FOREWORD, HONEST, AND PERSONAL JOURNEY WITH GOD BY FAITH TO A HEALTY MARRIAGE. 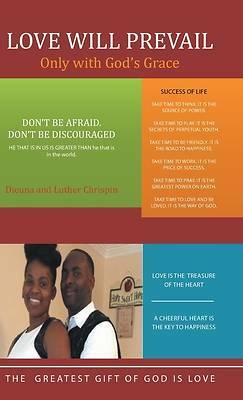 ITS AN EXCELLENT RELATIONSHIP BOOK FOR SINGLES AND COUPLES.